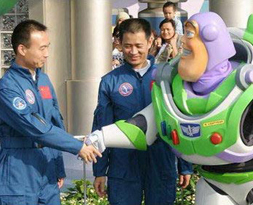 The two men toured Disneyland's "Tomorrowland" which features space theme and took pictures with Disney movie space character Buzz Light year. 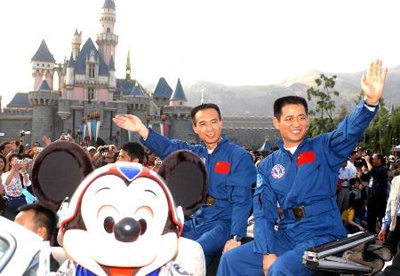 Instead of a routine parade of Disney characters in the afternoon, the two taikonauts, in their blue uniforms, toured the Hong Kong Disneyland streets in an open old-styled Rolls-Royce. Thousands of visitors in the park excitedly called them by names and took pictures with cameras and mobile phones. Even Mickey wore a specially designed space uniform. The two men also watched 3D computer digital fantasy film together with hundreds of audience there. During their visit to the Statue Square in the Central, they presided over a lighting ceremony for the newly arranged winter Christmas trees and put their cards for wishes on the Christmas trees there. Fei wished Hong Kong compatriots to live and work in peace and contentment while Nie wished Hong Kong a better tomorrow with great prospects. During their visit, they often waved to the Hong Kong citizens and shook hands with some of them. The two taikonauts and leading engineers of the Delegation of Shenzhou VI Manned Space Mission met with university students at Chinese University of Hong Kong and visited Hong Kong Science Park earlier in the day. The delegation arrived in Hong Kong on Sunday for a three-day visit.